AgencyFinder is known for it’s perfect combination of “high-touch” and “hi-tech.” As Chief Executive Officer, Chuck oversees all operations but personally manages the majority of all client searches. His extensive experience represents more than 40 years of advertising, publishing, marketing and sales and contributes to the breadth and depth of the service. He’s an outspoken advocate for the search process AgencyFinder represents and is also known for his sense-of-humor. In late 1996, he developed the architecture for the business development paradigm shift provided by Business Partnering International’s internet and off-line matchmaking services AgencyFinder.com and AgencyFinder.eu. With headquarters in Richmond, VA and technology center in Baltimore, MD, these databases encompass more than 8,000 world-wide agency locations including 95% of the top-ranked agencies in North America and the UK. During his career as President of Sales Marketing Institute, Ltd. and VP Business Development at Sanders Consulting, Chuck provided new business development instruction to more than 1,400 advertising industry personnel, produced more than 85 new business seminars; spoke at the original London and New York New Business Summits and partnered with ADWEEK to produce the first national US conference on Agency Reengineering. He’s available to speak on agency business development and the agency search process. Chuck also served on the client-side in positions as Director Marketing and Training, Director Sales and Marketing, and as founder and publisher of Richmond’s city magazine. Born in Elm Grove, Wisconsin, he’s an engineering graduate of the University of Wisconsin at Madison. As an auto racing fan and advocate, he maintains a competitive edge driving his Roush Mustang in speed events around the country. Chuck and his wife are avid animal lovers, looking after 2 “Newfies” and a Friesian mare. Vicky oversees the financial integrity of operations and hails from Woking in Surrey, England. The Bowring family has long-standing relationships in the financial world, serving as agents for Lloyd’s of London and as an International shipping conglomerate. Although she pays particular attention to AgencyFinder’s finances, she also enjoys business contact with many agency and client-types in her home country. She has three grown children; two married daughters with children in the Richmond area and a married son with children in Capetown, South Africa. A marketing professional with over twenty years of experience, Mike started working as an errand boy in his family’s advertising agency. After graduating from Southern Methodist University (Dallas, TX) in 1984 with a BFA in Television/Radio and Film Production, he began his professional advertising career at a small agency in Dallas, Texas. Soon thereafter he moved back to his hometown of Davenport, Iowa. 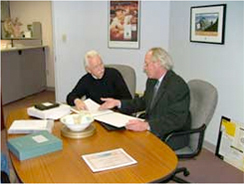 Within eleven years of arrival at the agency, he purchased the company and took over as its CEO and President. In 1999, Mike’s agency joined forces with the ECCO International Public Relations Network (which he helped to re-structure and grow) to provide global public relations support to a handful of multi-national clients. Mike’s experience now includes time consulting on marketing and media relations strategies directly with clients; as an adjunct professor of marketing and advertising at universities in the Midwest; and being a featured speaker and presenter at several national conferences and international conferences on branding and brand management. As a CPA, Amy went “independent” in April, 2009. She specializes in small business and the training of bookkeepers and owners to better manage their accounting procedures. She’s a QuickBooks Advanced ProAdvisor. In the past, Amy worked at the public accounting firms of Yount, Hyde & Barbour, PC and Rose, Sanderson & Creasy from Jan 2003 through April 2009. Prior to that she was employed by T. Rowe Price as Senior Portfolio Accountant and Systems Administrator for 12 years. Amy spends her time at her “rural Virginia” home with various animals and her guy – currently serving the US as a pilot in Afghanistan. She’s very active in several Optimist Clubs in the Richmond area and has served for years in several positions locally and at state level. During Virginia’s “State Fair Week”, you’ll find her deeply involved with the equestrian events. Mr Fonseca has over ten years experience as a systems engineer and consultant Mike also has experience in WAN and Data center environments. Mike Fonseca joined Entec Systems in November 2005. Previously Mike had been an Assistant to the Director and network engineer at NetTelcos for close to three years. Before that he spent two years as a systems engineer for Whitlock eBusiness Solutions. Mike started his IT career at the national helpdesk in the Bank of America Technology center. As primary Web Developer & Architect of the new AgencyFinder.com site, Kermit brings to the table considerable design and technical skills honed over thirty years in his career in Informational Technology. Kermit started in the medical computing field with pharmacy and physician billing systems. Working with local companies that served hundreds of regional businesses, he led several projects to integrate then cutting-edge computer systems to simplify billing practices and improve patient access to medical records. Later he founded Nova Design, Inc. with two friends. Nova Design published one of the first desktop video special effects packages and was used for the new field of digital compositing, special effects and image manipulation. Their software’s special effects were seen in major network television shows, cable shows and theatrical films. These days Kermit designs and creates websites for clients around the world.